Around the holidays we like to give back to the community. 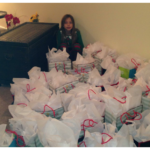 For the past 20 years we have been delivering gift bags for the women at the Women of Nations shelter. Women of Nations is a shelter for women and children, and one of the few that also accepts family pets. We go over on Christmas eve to deliver the bags; this year we also took a large bag of dog food. Many of the women come with very little, the bags have personal products as well as gloves, warm socks and some body soap, lotion,etc. 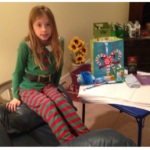 Here you can see the work being done by some of our favorite elves – Renei’s granddaughter (in her elf pajamas); she helped Renei pack up gift bags for the women at Women Of Nations.